I first came across Bonhoeffer’s writings many years ago when I became a Christian. I was introduced, by a friend, to Bonhoeffer’s ‘Letters and Papers from Prison’ and was instantly impressed by his humanity, intellect and the power of his insight into human nature and the call of God in a modern age racked with inhumanity and a disregard for conventional religion. Some years later, whilst studying in more detail Bonhoeffer’s theology and ethics, I was struck yet again by the urgency of his call to re-invigorate the Christian church and to re-orientate its focus back to Christ, albeit in a radically different manner to what its followers had become accustomed to. And so, it was with much expectation and interest that I bought ‘Agent of Grace’ to watch on the anniversary of Bonhoeffer’s untimely death. I wasn’t dissappointed by this film – it eloquently portrays Bonhoeffer as a Christian who struggled to work out in his own mind exactly what it meant to truly follow Christ in an environment where moral norms were subverted in the name of a twisted and amoral Nazi ideology. We see Bonhoeffer as he truly was – a disciple of Christ who consistently resisted the Nazi influence on the society in which he lived, and more importantly, the church which he served with zeal and conviction. From the very beginning, Bonhoeffer saw, and indeed articulated, the dangers of Hitler and National Socialism and what it meant. Bonhoeffer was very human, as his reflections show, but was mindful at all times, even when suffering persecution and when ultimately facing death, that he was a child of God. 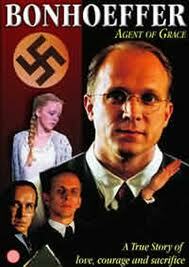 The film does an excellent job of showing Bonhoeffer coming of age in prison. Jailed for his role in an assassination attempt on Hitler, he was a source of strength and inspiration for fellow prisoners and guards alike. In a very poignant moment, Bonhoeffer is depicted as refusing an offer to be helped to escape prison and to effectively ‘disappear’; this offer he rejects on the basis that it would precipitate vicious Nazi retribution towards his fellow prisoners and family. In doing so he sealed his fate. Throughout the film the viewer sees Bonhoffer’s theology being worked out in practice. Central to his entire theological worldview is Christ who is at the very centre of a suffering world – a stinging repudiation of the Lutheran ‘two kingdoms’ concept. For Bonhoeffer the life of discipleship was sharing in that suffering and not retreating from a ‘Godless’ world, but actively participating in it and therefore acting as a beacon of hope and a pointer to Christ. ‘Agent of Grace’ is a worthy tribute to Dietrich Bonhoeffer, a man who is a testament to Martin Luther’s observation that ‘a man does not become a theologian by reading and knowing and understanding, but by living and dying and being damned’.